Two Passes with Camping for Shakti Fest in Joshua Tree, CA May 9-13! Grab your favorite yogi, and head to stunning Joshua Tree Lake Campground for Shakti Fest 2019! 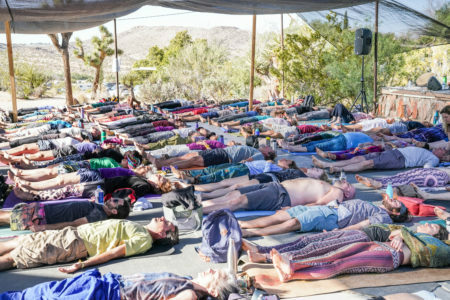 With an incredible line-up of sacred music, yoga and conscious workshops in the sacred high desert setting of Joshua Tree. Practice with premier yoga teachers, groove with award-winning sacred music artists and dive deep with world renowned spiritual teachers including Jai Uttal, Shiva Rea, MC Yogi, Donna De Lory, Saul David Raye, Dawn Cartwright, Fannah Fi Allah, Larisa Stowe and many more! Enter every day April 10 to 19 to increase your chances to win! Sorry this sweepstakes has ended. Bhakti Fest brings people together from around the globe to practice yoga, sacred music, dance, learn, grow and raise our consciousness. Bhakti Fest is dedicated to spreading love and consciousness to the world. Together we celebrate the ancient tradition of Bhakti (which means love! ).